One key difference between conventional MRP and DDMRP is that whilst MRP will try to net projected inventory or safety stock level (whichever is greater) to equate to 0, DDMRP does not project inventory and does not try to net stock to 0. MRP remains an appropriate tool when the lead-time for supply is shorter than the lead-time for demand, in this scenario MRP is the ideal just-in-time solution. In a DDRMP environment inventory buffers are placed where they will deliver strategic advantage by decoupling supply and demand and compressing lead-times. The decision of where to place strategic inventory buffers takes into consideration lead-time and the BOM matrix- identifies generic and semi generic materials decoupling. Once the location of the buffers has been decided, the buffer profile and supply order generation point can be defined. 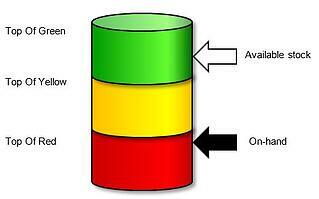 The buffers are represented by 3 zones- Red, Yellow and Green. Dynamic buffer adjustments are used to mitigate known future events by changing the size of the buffers to anticipate these events. For example, seasonal increase in demand or a capacity constraint. 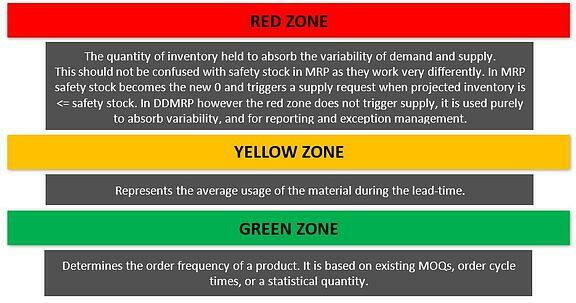 With DDMRP supply orders only generated when the ‘available stock’ drops to the top of the yellow zone, a confirmed supply order will then forward scheduled based on the lead-time. ‘Available stock’ is not the same as available inventory as seen in most MRP solutions. Available inventory in MRP typically represents the pyhsical stock on-hand at the location. ‘Available stock’ in DDMRP is the on-hand stock + all confirmed open supply orders – confirmed demand (Past due + due today + order spikes). DDMRP planning provides a simple visual planning solution which enables a focus on exceptions and priorities. As in the diagram above, planners can simply review the position of ‘available stock’ or ‘on-hand’ against the buffer zones. Where the prioritisation of supply orders is required planners can compare on-hand and available stock against the buffers zones, prioritising the lowest ‘available stock’ as a % of the buffer over those with a higher % against the buffer. Despite the obvious significant cost savings and efficiences DDMRP provides, it is currently not offered as a solution by any of the major ERP providers. Demand Driven Technologies’ flagship software R+ bridges this gap. Olivehorse is well positioned as the offical UK channel partners for R+. Our indepth expertise mashed up with extensive experience in SAP and R+ will ensure a seamlessly integrated DDMRP solution addressing your business needs. Download our Perspectives Report which shares a case study of a FMCG blue chip company.